Max Comfort® BioMedic™ memory foam dog beds provide more support per inch than most other Orthopedic dog beds, in fact we guarantee it. All our BioMedic™ orthopedic memory foam dog beds come with a washable microfiber suede cover with a zipper that zips around three sides of the bed and an inner waterproof "Leak Liner" cover with the same three sided zipper to protect the foam. Our combination of BioMedic™ foams make the perfect density bed for all dogs, constructed with a 2 inch or 3 inch cushioning layer of a high quality, high density memory foam on top of a high density base foam. Our foam is guaranteed not to sag or flatten out for the life of your dog! Our BioMedic™ memory foam dog beds are developed and designed to assure maximum comfort for dogs of all sizes and ages. Every dog bed has a proportionate amount of memory foam and support base foam, suited to the particular size and weight of your dog, determined by 30 years of dog bed manufacturing experience. Our beds are hand crafted in the USA using only the highest quality materials available. Don't be fooled by companies touting high quality dog beds when they are using low density and low quality foams or in some cases, using no memory foam at all to eliminate pressure points. Unfortunately, like with many Brands today quality has been sacrificed to offer consumers lower prices. BeyondBeds.com will not make those sacrifices we have been selling Memory foam dog beds with the same quality foam since 2005. Since then the market has been flooded with low density foam beds. Yes our beds may be a bit more expensive but, as the old saying go’s You Get What You Pay For. 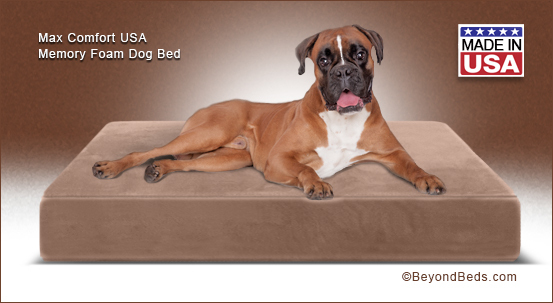 Since we guarantee our memory foam dog beds for the life of your dog, it will be the last bed you will buy! Our Quick Covers are designed to slip over the outer 3 sided zippered cover, made of the same Microfiber suede, the quick cover easily slips on to protect the top and four sides of the bed see "photo" below showing the underside of the bed with the quick cover on. High density foam core, comprised of (one) layer of 4 lb Gel Memory Foam to eliminate pressure points, laminated to (one) layer of high density polyurethane base foam for spinal support. The foam core is guaranteed for the life of your dog. Our foams are CertiPUR-US certified, made without ozone depleters, PBDEs, "Tris" TDCPP or TCEP flame retardants, mercury, lead and other heavy metals or formaldehyde. (one) "Moisture resistant" microfiber suede cover with 3 sided zipper. The microfiber faux suede is soft to the touch, elegant, durable and water repellent. (one) "Leak Liner" 100% waterproof inner cover with 3 sided zipper, made from soft medical grade material used in hospitals around the world on mattresses for urinary incontinence. Warranty: lifetime on foam. Made In the USA.